As some of you may have noticed, my website crashed this week and several posts are now missing including my post from Monday that kicked off voting for my annual project on the 50 best baseball players not in the Hall of Fame. I apologize for any inconvenience. 2) Your votes are safe and have been automatically inputted into a Google document independent of this site. To anyone who hasn’t voted, you can vote here and check out the reference ballot here. As a reminder, all votes for my project are due December 23 by 9 p.m. PST. I’m debating extending voting by a week because of the crash. It’s a short post for Monday, just long enough for me to tell of some new developments around here. This site has existed for almost two years now, and happily, it seems to continue to evolve. This past year has seen a number of new developments, from posts written by people besides myself to regular features to daily postings. Now, a few more things are going to be happening around here. First, I’m going to debut a Friday link post this week where I’ll link to some of my favorite content from other baseball blogs. A lot of blogs do similar-type posts, and I’ve been meaning to have one here for awhile. I’d encourage anyone to send me stuff they’ve read that they consider worthy. I also welcome anyone to email me their own material. Also on Fridays, Bill Miller and I will be collaborating on a series for his blog, The On Deck Circle. Bill and I are going to alternate weeks writing about good players on bad teams. I will be writing about players prior to 1961, while Bill will cover 1961 to current day. Bill is going to post the first column this Friday, and we will do it until Opening Day. The articles will be strictly on Bill’s blog, though I’ll have a link to the latest installment of the series each Friday. Of course, Bill and I welcome suggestions on who to write about. Starting next Sunday, I will send out a weekly mass email with links to every post on this blog from the past week. I have a few hundred email addresses accrued from comments and emails I’ve received, and I’d like to offer something that serves up the content of this site directly to readers. Comments and suggestions are welcome and appreciated, as always. I quit playing Little League when I was 11. I never excelled at baseball as a child, and fifteen years after my final season, some of the things I remember most are that I struck out fairly often, I was a decent outfielder, and maybe once a season, I could hit a fluke triple. I do not trace my favorite childhood experiences to Little League. I treasure memories of going to Candlestick Park, playing epic Wiffle Ball games with my dad in our driveway, and accumulating tons of baseball cards before I understood their value. It’s harder to get nostalgic about mediocrity. In sixth grade, I had a bad season. My teacher assigned an average of two hours of homework a night to prepare my class for middle school, and while I later aced seventh grade, my passion for playing baseball died. Twice a week in the spring of sixth grade, I sat three out of every six innings on the bench for my team, and it began to seem like a waste of time I needed for homework. I never played another season. So it was with some excitement and trepidation that I greeted an invitation to join an adult softball team this year. I wondered if I’d be a different player with the strength of a grown man, or if this would merely be a continuance of my crappy childhood career. It turned out to be a little of both. I still sat the bench about half the time, partly because we were a co-ed team who needed to keep a certain amount of female players on-field, and we had more male players than we knew what to do with. I also still wasn’t a very good hitter, at least early in the season when I struck out swinging a few times, which is embarrassing in a slow-pitch league. For a time this year, it was like I was 11 all over again, and I sometimes resented giving half my Sundays to games or practices. Even as I’m in my 20s and relatively unencumbered, my life is busy. I’m glad I didn’t quit the softball team. I improved as the season progressed, up to my final at-bat. We were in our tournament elimination game on Sunday, and I came to the plate in the last inning with two outs, our team down 12-9, and the bases loaded. I smacked a two-run single and represented the winning run, though I got stranded at second base, and we lost. Regardless, it’s the kind of experience that will keep a player coming out. I look forward to next year. I grew up in Sacramento, not far from the Old City Cemetery and a parking lot across the street where a Pacific Coast League ballpark once stood. Both places have long since stoked my imagination, so I was excited to hear the local chapter of the Society for American Baseball Research would be sponsoring a baseball-themed cemetery tour on July 24. In fact, I looked forward to it for much of the summer. I expected tons of anecdotes and the chance for me to wax poetic about a graveyard with headstones dating to 1850. But the most interesting things I heard Saturday were among the living. While we stood under the glaring sun that turns Sacramento into a microwave every summer, listening to a couple of our own talk about 19th century ballplayers buried nearby, a well-dressed woman approached. It was Susan Fornoff, our scheduled speaker for a luncheon to follow the tour. Fornoff covered the Oakland A’s for the Sacramento Bee and is most known for being the first female reporter admitted into locker rooms after games. She wrote a book some years ago, Lady in the Locker Room and said Saturday that a Hollywood producer and screenwriter are developing it and are interested in Katherine Heigl for the lead role. They’re thinking a baseball version of The Devil Wears Prada. Before Fornoff spoke of this and more, we had the tour. The highlight for me was seeing a new headstone that Sacramento chapter member Alan O’Connor purchased for Billy Newbert, a former California League ballplayer. Newbert played for the Sacramento Altas in the 1880s, later ran a hardware store at 17th and J Street (where a record store stands today) and died in 1944. In researching his 2008 book on Sacramento baseball history, Gold on the Diamond, O’Connor discovered that Newbert lay in an unmarked Old City Cemetery grave. He paid $280 for a flat marble headstone and was later reimbursed by SABR. Beyond that, I didn’t get much into the tour, which proved short because of our 1 p.m. deadline to be at the restaurant. I’ve been in the cemetery many times, and between the historic section and an adjoining modern half, it can be easy to lose one’s self there. We barely scratched the surface. No one mentioned the most interesting baseball anecdote I know regarding the cemetery: The old ballpark across the street, Edmonds Field was so close that children used to gather amidst the headstones to catch foul balls. Thereafter, we adjourned to an all-you-can-eat Chinese buffet walking distance from the cemetery, and Fornoff spoke. She fielded the obligatory questions about being a woman in the locker room, recounting how a man once asked her which player was most-endowed (for contrast, imagine that question being asked to a male beat reporter.) Fornoff said she refused to answer besides to say Reggie Jackson thought he was. I asked Fornoff if she’d do an interview here if I read her book. She said she would. I have a stack of baseball books to conquer but will add this one to the queue. In a perfect world, it leads to an interview with Heigl. I went camping this past weekend near Coloma, California, and on my way back to the Bay Area on Sunday morning, I stopped by my parents’ house in Sacramento and had breakfast with them. I’ve been living near Oakland for a few years, and I don’t see my folks nearly enough. It was great eating my mom’s waffles and drinking out of the Batman mug that I got when I was six. I’ll be 27 in a few weeks but I still insist on using that mug every time I’m at the house. During breakfast, we talked baseball a bit, and my parents mentioned the Giants’ new policy of charging varying rates on tickets depending on who’s playing. It’s called dynamic pricing, and it basically dictates that the same seats that might cost $6 for a Giants-Marlins game could go for $30 when the Dodgers are in town. I’ve been a Giants fan since about the same time that I got the Batman mug, and I understand people upset about the new pricing structure, though it seems reasonable from a business perspective. Also, remembering my own experience, if I was bringing a kid to a game, I’d rather take them to see the Marlins than shell out extra for the Dodgers. It doesn’t make much difference to a kid. For all I know about baseball now, I was pretty much clueless the first time I went to a game in August of 1987. My parents and I were visiting family in Seattle, and my Uncle Brett, my dad and I took in a Yankees-Mariners contest at the Kingdome. I had recently turned four, and every half inning, I asked if the game was over and we could go home yet. I mentioned about this in the discussion on dynamic pricing Sunday morning, and my dad said Dave Righetti got the save that game, which led me to find something more. Using what my dad said about Righetti, I visited Retrosheet on Sunday afternoon, looking for a day in August of 1987 where the Yankee closer got a save at the Kingdome. The only game that fit this description occurred August 18, a 4-3 win for the Yankees. Though I don’t remember, it appears I got a great first game. If I had a time machine, I know I’d enjoy watching Don Mattingly go 3-for-5 and seeing the Mariners almost tie the score in the bottom of the ninth, getting to Righetti for a run. I may not have understood it then, but I value it now. I occasionally write posts related to my childhood. To read some of them, go here. Jones is a sentimental pick at National League DH, and with no third baseman doing anything especially noteworthy in that league, I was almost tempted to give the possibly-retiring Atlanta Brave the start. Beltre gets the nod for resurrecting himself, as does Guerrero, and I was tempted to tab Barry Zito for the same reason, but Jiminez has been simply too amazing, in this, the Year of the Pitcher. Lee may be a consensus choice as AL Cy Young, though if I was simply picking who’d make the All Star start, I’d tab Armando Galarraga to make a statement. Mostly though, I went off of Wins Above Replacement (WAR) data to determine my picks. I used a Web site I recently learned of called TheBaseballGauge.com, which allows any number of different WAR comparisons, including by position and league. I encourage any fellow baseball geeks to make use of it. It could be the new Baseball-Reference or Retrosheet for fanatical baseball researchers. IBWAA All Star voting ends Wednesday, June 30, 2010, at 9:00 p.m. PST. Anyone who writes about baseball in any capacity on the Internet is eligible to join (yearly dues are $20) and cast a vote for this, as well as Hall of Fame selections at the end of the year. Email Howard Cole, baseballsavvy@aol.com for more information. I’m standing next to Tom O’Doul, 67, who looks so much like his famous cousin Lefty O’Doul it’s uncanny, and as we view a painting of a bat boy for the team Tom once knew, he says it’s fairly accurate. Never a bat boy himself, though he got to go in the dugout during games, Tom explains a subtly the artist captured, how San Francisco Seals bat boys received a blue cap with SEALS in white block letters, while players got caps with SF lettering. It’s the sort of attention to detail that sometimes gets neglected in other works. Art and baseball don’t always have the smoothest conflux, as Lefty O’Doul could attest from his time trying to teach Gary Cooper how to properly swing for Pride of the Yankees or the makers of Field of Dreams might cop to, since they had Shoeless Joe Jackson bat right-handed since he hit from the left but Ray Liotta could not. 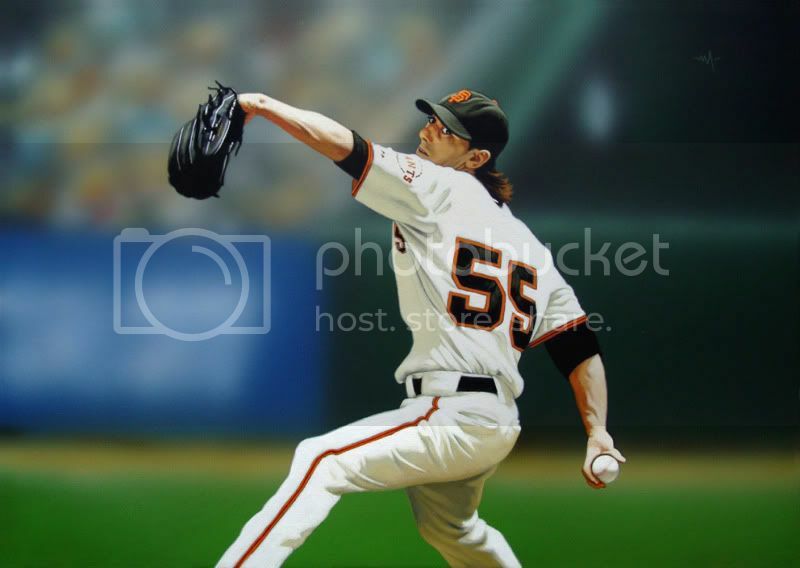 Still, many of the works in the 13th annual Art of Baseball exhibit at the George Krevsky Gallery in San Francisco accurately reflected the game. I attended the exhibit Thursday evening with Tom O’Doul and other members of the Society for American Baseball Research, which I recently joined. Coincidentally, the gallery is three blocks down Geary Street from Lefty O’Doul’s bar and restaurant. I’m generally not much of a museum guy. While some people spend hours looking at a painting, I could probably do the Louvre in under a half hour. Heck, I even breezed through the National Baseball Hall of Fame when I was there in 1997. So I don’t have any sophisticated artistic expertise to offer here, besides to say that aesthetically, I found the show pleasing. I enjoyed talking baseball with the various people in attendance, including gallery owner George Krevsky, who said he played baseball for Penn State. I pride myself on my baseball library, and Krevsky has one that could rival it in the office that connects with the main room of his gallery. Along with classics I’ve read like The Boys of Summer and Baseball’s Great Experiment, I noticed copies of three books by Jim Bouton, one of my favorites. Krevsky said Bouton used to play handball with his father, who was nationally ranked and that in years past he’s wanted to get Bouton to the show. This year, Krevsky featured a reading and signing by another author, Jeff Gillenkirk, who’s written for The New York Times, The Washington Post and Mother Jones magazine and whose latest book, Home, Away debuts this month (Gillenkirk said a glitch on Amazon says it can’t be purchased there until September but that it’s available on his publisher’s Web site.) The book is about a ballplayer who leaves the big leagues to be closer to his son, and Gillenkirk read an excerpt where the 39-year-old protagonist winds up in independent league ball at $65 a game. All in all, it was an enjoyable night and probably the last time I’ll go to an art show for a long time unless I meet a girl or the San Francisco Giants invite me to a gallery opening. In a perfect world, both could happen. 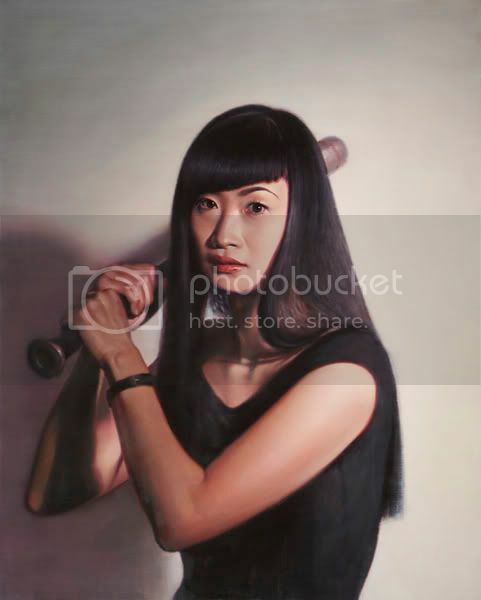 I’ll close with this last work by Valentin Popov, a Ukrainian-born artist Krevsky said he’s admired for years but had never painted baseball before and “didn’t know baseball from a pineapple.” I would be interested to see what other baseball works Popov can produce. I went to the Old Timers Lunch on Friday in Sacramento, to do interviews for my book on Joe Marty. It was a good day in my life. I did a couple of key interviews and also got to talk to a former Sacramento Solon named Gus Stathos. Stathos, who I interviewed at the estate sale of former Solons owner Fred David in February, never played with Marty and was a career minor leaguer. The closest he came to making the show was when the Brooklyn Dodgers brought him to spring training at Vero Beach, Florida in 1947. Stathos played that spring with Jackie Robinson, who was weeks away from becoming the first black man in 83 years to play professional ball. A couple of cool things happened for me baseball writing-wise this week. First, as regular readers may know, I joined the Internet Baseball Writers Association of America on Wednesday. Since then, I have been talking with the head of the group, and he has invited me to write for a Where Are They Now section on his Web site. It sounds perfect for me, since I love talking to old ballplayers. 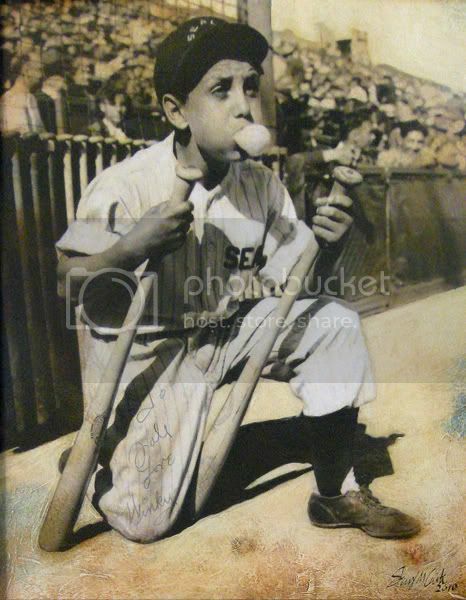 I have a tentative first assignment to interview Gino Cimoli, who lives in the San Francisco Bay Area and was the first man to come to bat on the West Coast, after the Giants and Dodgers moved west. While perusing the “Where Are They Now” section to see what the articles look like and who’s already been written about, I noticed a feature on one of the three former teammates of Joe Marty that are still living. As faithful readers here will know, I began research in January for a book on Marty, who played in the majors from 1937-41, and I interviewed another of the ex-teammates in February. I haven’t had any luck getting the other two men on the phone, but seeing the “Where Are They Now” feature gave me some hope to try again. Thus, I called and spoke with this man’s son, asked about arranging a phone interview, and offered to send questions for preparation as I did with the other player. I wouldn’t normally do this as a journalist, but I’m willing to make exceptions if my interview subject is over 90, as all three of these players are. The son was fine with this and said he and his dad would do what they could for me. I put a list of 30 questions in the mail yesterday along with my callback number and am keeping my fingers crossed that this comes off. I am deliberately not posting the names of these players for search engine purposes, but this particular player is somewhat well-known and is the last living person to have played in a game with a man who hit 714 home runs (again, I word it that way for search engine purposes, please don’t leave an “Aha” type comment.) Basically, it would be awesome if I get this interview. As I’ve said before here, I feel like I’m getting to take part in something greater than myself with this project. I’m also starting to feel it has historical importance. I typically use a 90-minute digital recorder for interviews and wind up having to delete old interviews when I need space for new ones. It’s unfortunate– in the last couple of years, some of the interviews I’ve deleted include Oliver Stone and Jose Canseco (a full transcript of my Canseco interview, though, can be found here.) I want to keep a record of everyone I talk to for this project, especially if the book gets published. Thus, I bought a tape recorder, batteries and a ten-pack of tapes yesterday and spent over an hour in the evening getting the interview from February transferred over. To say the least, I’m excited about what lies ahead.